This is a photo of the entrance to the Dream Suite at Disneyland Park in Anaheim, California. 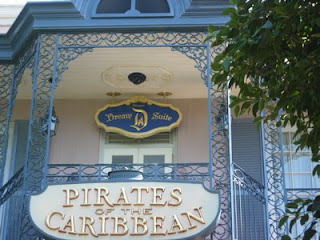 The Dream Suite is located above the Pirates of the Caribbean attraction. It was originally designed to be a nice apartment for Walt Disney and Roy Disney when they stayed at Disneyland, but Walt died before it was completed, and the space was never used for overnight guest stays until now.